Mount's Bay has been acclaimed as one of the 'Most Beautiful Bays in the World'. It is a praise that is richly deserved by this vast stretch of glittering water and its spectacular coastline that runs in a great arc from Land's End to Lizard Point. As a member of a prestigious world-wide association, Mount's Bay is often compared with Paria Bay in Venezuela, San Francisco Bay and Cape Cod in the United States and Santorini Bay in Greece. Majestic cliffs, rocky coves, pristine sandy beaches and crystal clear seas vie with the heather and gorse of the moors and early Christian and Bronze Age sites to form a landscape that is the heritage of a proud culture, and a source of inspiration for artists, writers and poets. 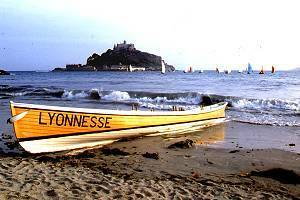 The town of Marazion is set on the shores of Mount's Bay. Famed as the “jumping-off point” for St Michael’s Mount, accessed over the beach via a stone causeway at low tide and by boats at high tide, the town is one of the oldest in Britain, established with a charter in approximately 1250. Originally called "marghas yow" meaning "Thursday Market" in the ancient Cornish language. It was the major town in West Cornwall until the early 1500s when Penzance was granted a charter.